Added three new stations to the AM radio log this week. 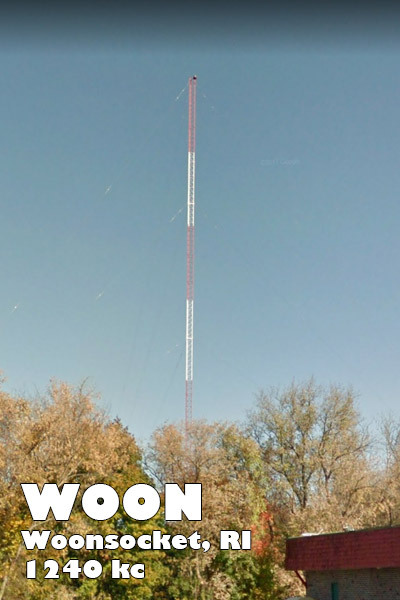 WOON on graveyard channel 1240 kHz transmitting 1 kW from Woonsocket, Rhode Island, 79 miles to the east-northeast. WBRK on graveyard channel 1340 kHz transmitting 1 kW from Pittsfield, Massachusetts, 58 miles to the north-northwest. WVBF on 1530 kHz transmitting 4 watts (!!!) from Middleborough Center, Massachusetts, 99 miles to the east-northeast. Thursday night, I also heard BBC4 on 198 kHz stronger than they have been in long awhile. Everything was heard on my ELAD FDM-S2/FDM-SW2 receiver and 80-meter inverted Vee antenna.